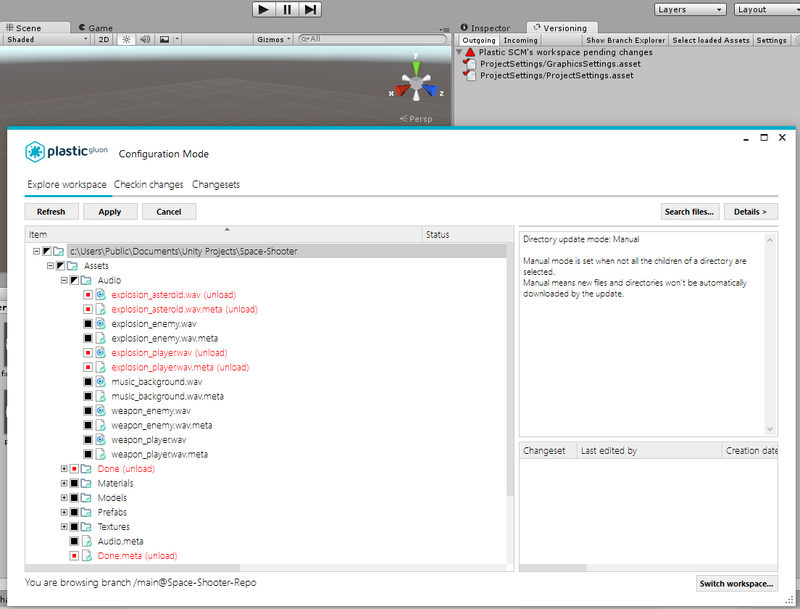 Plastic SCM release 729 includes a number of improvements in the version control integration with Unity 3D. Most of them are related with a better integration with Plastic Gluon our GUI and workflow for artists and designers in game dev teams. Gluon now actively handles .meta files to prevent to forget them during checkin or workspace configuration. The Unity plugin adds a way to invoke “Gluon workspace config” and better progress during the update operations. This is one of the key new features added to the Unity plugin: now, when working in Gluon mode, you can configure what files are you working on directly from Unity. Just as a side note for those not familiar with Gluon: Gluon enables you to work on a different way with Plastic workspaces. Instead of working on a “changeset basis” where you need to be in sync with a given changeset all the time, now you will work on a file per file basis. You can checkin a file even if the sibling ones are out-of-date, something that is a huge sin in code (you can break the build!) but perfectly fine when working with art, documents and so on. That’s also why in Gluon you can hand pick which files come to your workspace from the repo, which lets artists avoid downloading tons of big files when not needed. Learn much more about it here. 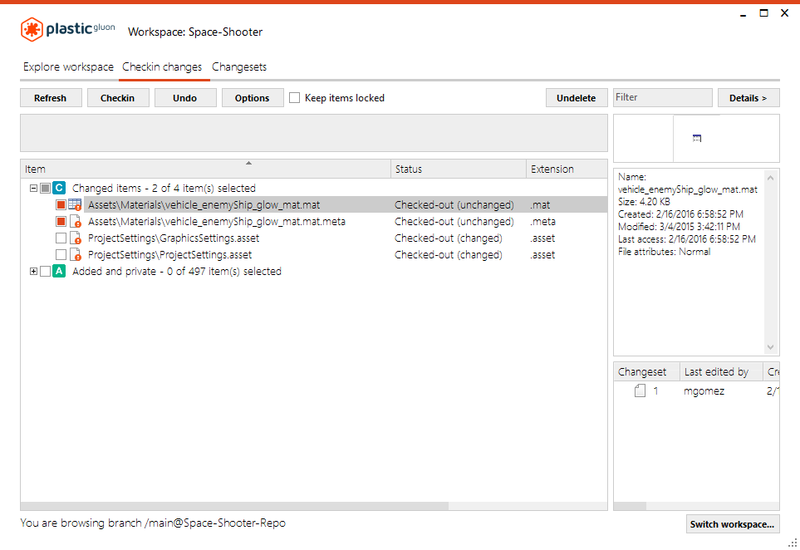 Now the new “Select loaded Assets” button will launch Gluon in the “configuration mode” in your workspace so that you can easily select what has to be loaded or unloaded from your working copy. This is one simple but really important change for Unity users: now each time you checkin a file from Gluon, it will try to locate its associated .meta and if it finds it, it will auto select it. The same happens in “Configure workspace” mode, where Gluon automatically selects the associated .meta avoiding uncomfortable situations in Unity when the related .meta is not present. 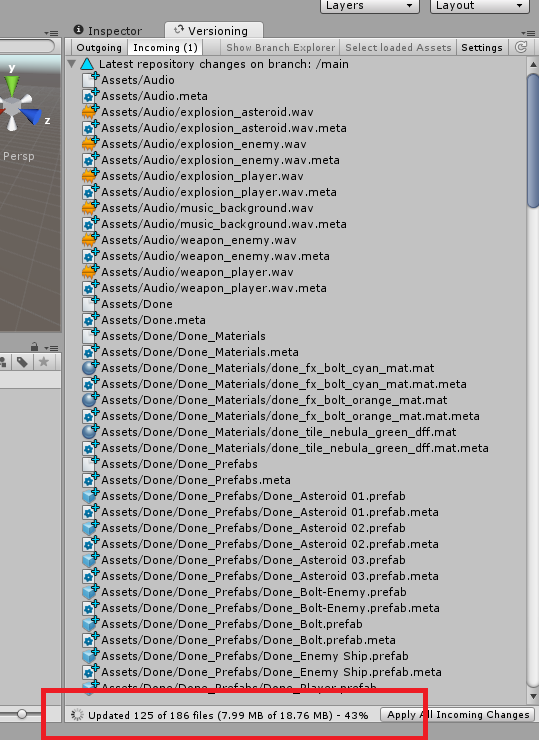 That’s all about Unity integration improvements, although we’re working on a few more updates that will be released soon. Remember to check our Unity Stealth Demo using Plastic SCM to learn more about the integration.